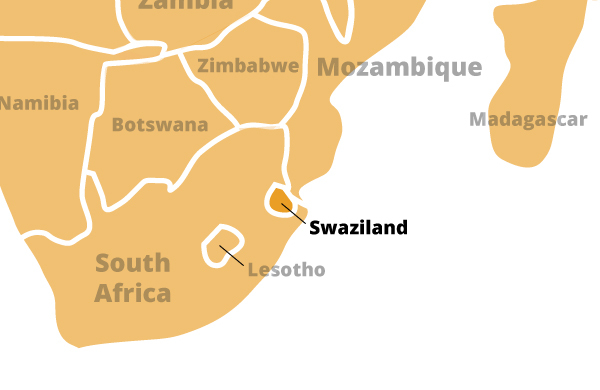 Surrounded by South Africa, except for a short border with Mozambique, Swaziland depends heavily on South Africa from which it receives more than 90% of its imports and to which it sends 60% of its exports. Subsistence agriculture employs approximately 70% of the population. The manufacturing sector has diversified since the mid-1980s. Sugar and wood pulp were major foreign exchange earners; however, the wood pulp producer closed in January 2010, and sugar is now the main export earner. Most Swazis construct their own homes from rocks, logs, clay, and thatch. Those with sufficient funds hire builders and buy corrugated iron roofs, glass windows, and solid wood doors. In a traditional Swazi homestead, family members do not have chairs or beds. They sit and sleep on grass mats. They cook on an open fire in the hut or in the yard. Their tools and utensils are limited and often homemade. Urban dwellers have better access to electricity and piped water.